The Hanged Man is the 12th Major Arcana card. Striking imagery gives way to an initial simple interpretation; You are at a crossroads. The Hanged Man represents letting go and sacrifice, with the aim of achieving a new point of view. Past – The Hanged Man in the Past position represents something in the past that you’ve gotten rid of, and for the better. Sacrifice seems harsh at first, but we truly grow from it. Think about how you’ve grown from all the things you’ve given up in the past. Present – The Hanged Man in the present position represents that you’re facing a choice or decision. You might have to give something up to go the right way. It could, for example, mean moving away and having to give up local connections, or going to a new job or school and losing your circle of friends and acquaintances. Future – The Hanged Man in the future position means you’ll face an upcoming decision. We face choices every day from the moment we wake up. Deciding when to get up is usually the first choice for many of us. Start your day right with motivation and a goal each day. Set goals and achieve them. 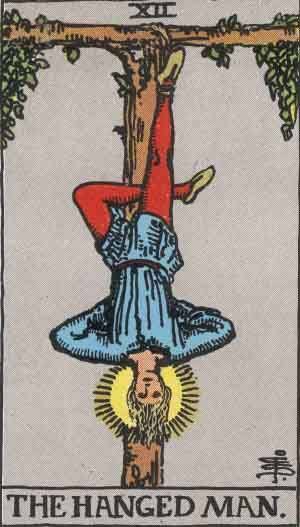 Work / Education – The Hanged Man in regards to work or education means you should stop and think about your future. There might be two paths ahead of you to consider, both equally viable. No need to rush, consider your options and ask people who have gone both ways. Romance – The Hanged Man in romance suggests that you should take some time to think about your relationship. How is it? There might be an aspect that you just need to get rid of, something that is bothering the both of you, like a hobby that is taking up too much time. Either way, it’s going to be a mutual decision. If you’re single, how are your friendships? Friends – The Hanged Man in regards to friendship might mean that it’s time to get rid of those toxic relationships. Some people choose to have friends that they don’t really get along with, rather than have nobody. Is that the right choice? For some people it might be, but are you one of those? There’s no right or wrong answer. It’s your life. Money – The Hanged Man in regards to finance means now is a good time to share the wealth you’ve accumulated. Money stagnating does nothing, it doesn’t even work for you. What is the wealth of money? Surely it’s potentiality. Money is nothing until you buy something with it. Don’t buy everything, make sensible purchases. Remember that money sitting in your bank account could be doing so much more. Health – The Hanged Man doesn’t look like a good omen in regards to health. Any dead person wouldn’t really. It might mean that now is the time to give up that bad habit. Do you smoke, drink, or eat too much and exercise too little? Try to change it as soon as you can. Spirituality and Mentality – The Hanged Man in spirituality suggests an air of asceticism. If you can, try living without material possession for a while. It might be really good for you. Do you need these things you have every day? Consider any choices you have made recently, were they correct, has it gone to plan? Every day we make choices, good, bad, selfless and selfish. You may have made a bad choice recently, and lost something that you wanted to keep. It happens, and there may be a chance to go back and fix your wrongs. Consider your past choice and where you have ended up today. Good and bad have both made you. Learn from your good and bad choices. As a Yes or No question: It depends wholly on the question, likely No. We’ve selected live tarot readers to give you a FREE 3 Minute interpretation of the Hanged Man! Scroll through them below and pick your favorite one.